LSBU's School of Health and Social Care has a long and well-deserved reputation for providing high quality education and training. As a university, LSBU undertakes research that makes a difference. The School has over 400 teaching/research staff and a student body of over 7,000, with campuses in Southwark, South London and Havering, East London. The Southwark campus has sophisticated facilities including 14 interprofessional skills laboratories and the Havering campus provides high quality educational facilities. 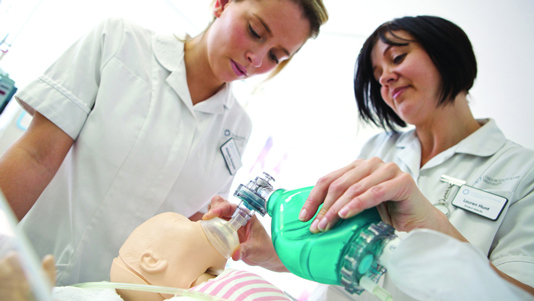 LSBU is the largest provider of CPPD for the health and social care workforce in the South East and is proud of its high reputation in the field. The School works with more than 60+ NHS partner organisations from in and around London to deliver a wide range of educational programmes for a variety of healthcare professionals. These include bands 1-4 workers, nurses, midwives, social workers and many Allied Health professionals. Our CPPD Portfolio includes a range of programmes, modules, study days and bespoke projects that have all been designed to meet the needs of our service colleagues. Programmes are designed and implemented in collaboration with them to ensure we support workforce development that is not only fit for today but can lead and innovate in the future. Most of these programmes are clinically focused and are becoming increasingly work based. Our complete CPPD Porfolio is designed to be flexible and offer a variety of delivery modes including e-learning and all are underpinned by a robust research and practice based culture. LSBU enables staff at every level to realise their potential to deliver high quality care to all. Our superb central London facilities provide an ideal environment for clinical skills development and simulation learning using the latest technologies. The skills laboratories and lecture rooms are equipped with facilities for teaching a variety of skills in a safe environment, allowing participants to develop high levels of competence and confidence under close supervision. Read more about School facilities in our Story Finder. Our CPPD is innovative and contemporary to meet future needs of the healthcare workforce. Unusually for a University, we offer programmes for all levels of healthcare staff. These range from study days to foundation degrees for staff working in bands 1-4, top up degrees for health care professionals wishing to become graduates, specialist modules, master's programmes and professional doctorates for a variety of healthcare professionals. Our flexible, modular approach to CPPD allows individuals to study and reach their goals at their own pace, that fits in with the organisations requirements. Our bespoke online application system allows people to browse for CPPD and apply on line, with no need to fill out lots of paperwork. The system requires the sponsoring organisation to approve the application, ensuring employer involvement from the outset. Read our CPPD Portfolio and complete an application. Our online reporting system allows you to monitor the uptake of academic programme and student progression. Employer receive monthly reports from our system and each employer is allocated a customer account manager to oversee this process. Undertaking CPPD at LSBU means learning from experts with excellent knowledge and clinical skills in their area of speciality. Many of our academic staff hold joint posts between LSBU and some of London's most prestigious hospitals and healthcare services. The School of Health and Social Care has 13 professors with expertise that covers all branches of nursing, midwifery, public health and health promotion, occupational therapy, traditional Chinese medicine and social work. Read more about the university's centres and themes and research degrees at LSBU. If you can't find a CPPD module that suits the needs of your workforce we offer a variety of bespoke opportunities, created in partnership with managers that meet the demands of healthcare's ever-changing climate.